THE PERFECT INGREDIENT FOR MAXIMUM DELIGHT! 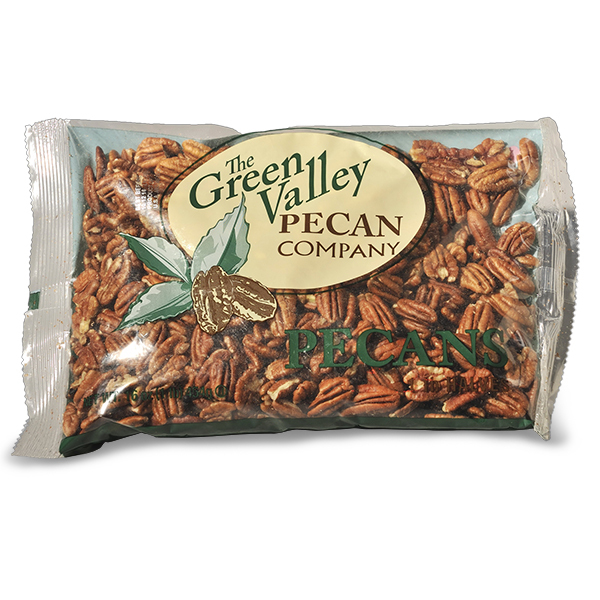 Please Note: Most of these recipe links connect to an external website not associated with Green Valley Pecan Company. It is provided solely as a convenience to you. 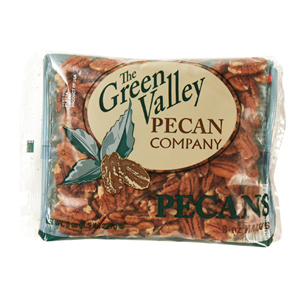 Green Valley Pecan Company is not responsible for the accuracy, quality, safety, or nature of the content on the linked site. Honey Pecan Berry Yogurt ParfaitLayer pecan pieces, honey, fresh berries and yogurt for a simple, satisfying and nutritious breakfast. Pecan Protein PancakesA power packed breakfast that’s made in just 15 minutes. Combine pecan pieces, bananas, rolled oats, protein powder and cinnamon for protein pancakes that are made even more nutritious with pecan halves on top. Breakfast Bread Pudding with Pecan CrumbleThis breakfast bread pudding a day ahead of time making it a great option for easy entertaining. When you’re ready to serve it, simply prepare the pecan crumble and pop it in the oven for a delicious and satisfying dish. Pecan, Ginger and Dried Apple GranolaNaturally sweet pecans combine with oats, cinnamon, and dried apples for a delicious, wholesome snack that can be enjoyed on its own or on top of yogurt for breakfast. Spiced Citrus Pecan Breakfast BreadSavor the taste and aroma of naturally sweet pecans paired with citrus and spices. Pair it with a side of fresh fruit at breakfast or have it with tea for a delicious afternoon snack. Grilled Cheese with Pecan and Sundried Tomato SpreadA classic sandwich gets a fresh, nutritious twist on it with this grilled cheese. Add the pecan and sun dried tomato spread for a dish the whole family will love. Wild Rice Pecan Burgers with a Creamy Sunflower Chive SpreadThis veggie burger is chock full of wholesome ingredients. This plant-based version is made with pecans, wild rice and chickpeas and then topped with a creamy sunflower chive spread and toppings that will satisfy your burger cravings. Pecan Brie Honey CrostiniBy combining four pantry staples, you can whip up this flavorful and simple appetizer in less than 10 minutes. Pecan Deviled EggsAdd a naturally sweet crunch to this classic appetizer dish. Serve it as a nutritious finger food for a spring gathering. Pecan Stuffed DatesServe these three-ingredient pecan stuffed dates with blue cheese as a quick and easy appetizer at your next gathering. Pecan, Orange and Bourbon Glazed HamCoated with crunchy and naturally sweet fresh pecans, orange juice, bourbon and maple syrup, this recipe hits the spot for savory and sweet lovers alike. Serve as a main for your next gathering alongside your favorite veggie or salad, and use leftovers for sandwiches or brunch the next day. Sheet Pan Eggs with Pecan Breakfast “Sausage”This vegetarian version uses seasoned ground pecans as a nutritious plant-based option for “meat.” Simply add eggs and spinach for a simple breakfast dish that can be prepped ahead, feeds a crowd and requires minimal clean-up. Spicy Pecan Italian “Sausage” and Grilled Vegetable PenneSimply season and ground pecans to create a plant-based version of spicy Italian “sausage.” In this recipe it’s added to grilled vegetables and pasta but you can also use it on a flatbread, pizza, soup and more. Spicy Pecan Italian “Sausage”Ground pecans and season them with herbs and spices to create a plant-based “meat” alternative. Use this spicy Italian “sausage” it on a flatbread, pizza, soup and more. You can also use different seasonings and use it on tacos or in a breakfast casserole. Superfood Pecan Energy BarsThe whole family will love these superfood pecan energy bars. They’re simple and nutritious, making them a perfect on-the-go snack! Pecan Crusted Asian Turkey Meatball Lettuce WrapsPecans lend extra crunch and nutrition to these Asian-inspired (and optional Whole 30 approved) turkey meatballs. Serve in lettuce wraps, on greens for a salad or make it into a bowl and serve over zucchini noodles. Pecan Super Seed Crumble Overnight OatA nutritious grab-and-go breakfast will guarantee you start the day off right. Prep overnight oats the night before and always have a batch of pecan super seed crumble on hand for an easy morning meal. Add peaches or fruit of your choice, if you’d like. Pecan Crumble can also be topped on yogurt or oatmeal. Pecan Crusted Nashville Hot ChickenTake Nashville Hot Kitchen up a notch by encrusting it in pecans! Serve alongside a pickled collard pesto and pimiento cheese if you’d like, for a delicious Southern spread. Pecan and Roasted Vegetable Pasta Bake with Sage Cream SauceThis flavorful vegetarian pasta bake will take your weeknight dinner lineup to the next level. Pecan gremolata, seasonal vegetables and spaghetti combine for a comforting dish that’s sure to be a family favorite! Visit our Pecan Store to find the premium pecan ingredient!